I don't do too many "me too" posts, but every now and again I make an exception when I read something that really gets my head to nodding. Michael Bane posted about how American men may finally be tiring of "metrosexual" nonsense and being men. But that's not what got my head nodding. He mentions this John Lott article on the decline of gun stores thanks to over-regulation. Michael Bane mentions he's been feeling unease over just this problem. We may be winning the battles of public opinion, laws, etc, but may wake up one day and find we can't buy a new gun to replace Ole Betsy. Bane mentions the need to have a national firearms agenda. I have to agree with his point, thus the nodding head. As Lott and Bane point out, we can no longer buy guns in Wal-Mart or other stores. 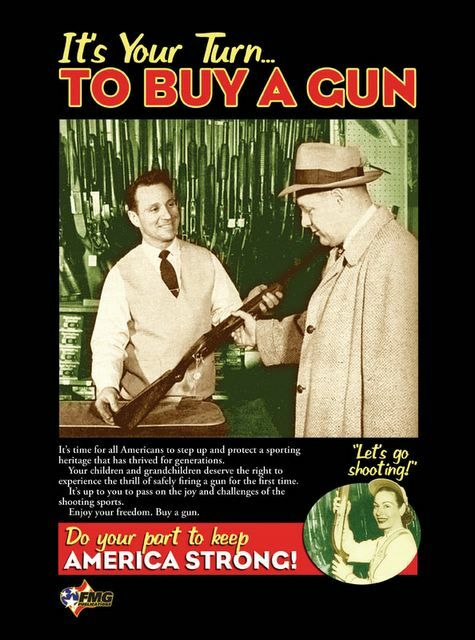 I remember when a trip to Sears involved a good look at their guns. That's a thing of the past. Now, I'm not saying that Wal-Mart or Sears are the best places to buy guns. They're not--Support your local gun shop and all. But we've lost a time when guns were common, ordinary tools to where they've become mythologized and demonized. Sometimes it's Hollywood that creates the myths. Hollywood depicted guns as being able to blow up cars. People who were shot with one would fly several yards through the air (the TV show Mythbusters has de-mythed these and other gun fallacies). These myths hurt us because most Americans now live separate from nature. In the recent past, people hunted and knew a .30-06 didn't hurl a deer 20 feet through the air. Now, people have no context for what they see, so naturally they say, "something oughta be done about guns." When Congress Critters and others hear that a certain percent of the population wants "something to be done" it's like adding liquid oxygen to a fire. They pass laws based on their own inadequate understanding of guns (and other things as well, like Internet tubes). The next thing you know, we're in a cultural and legal battle for our gun rights. We need that national firearms agenda that Michael Bane mentioned even though we gunnies are divided. We need to be the ones who tell the Congress Critters that now is the time to rein in or disband the ATF and reduce regulations and other gun laws. As consumers, we need to support any store that sells guns or ammo. We need to take a non-gunnie shooting and win this war. Now I can stop nodding my head--I'm getting dizzy here. “No Bill of Attainder or ex post facto Law shall be passed” at least according to the United States Constitution. These words mean something, but governments—local, state, and federal—are constantly trying to refine their meanings. A bill of attainder is a law that applies to only one person or entityand they're not a huge problem (except maybe the recently struck-down law in Maryland dealing with how much Wal-Mart had to contribute to their employees’ health care), but we gunnies must fear ex post facto laws (that is, government making something illegal and then prosecuting you for doing it even though it was legal when you did it). One possible example of an ex post facto law is the Lautenberg law—if someone is convicted of a misdemeanor crime of domestic violence, then he or she is barred from gun ownership forever, unless they’re pardoned by a governor or president. Lautenberg is ex post facto by most reasonable definitions, but it has never been struck down as unconstitutional. Its supporters get around ex post facto problems by saying that owning a gun prior to the conviction is not punished; however, continued ownership is illegal. Thus you sell or must turn in your guns even through you’ve owned them since you were 18 years old. If you’re caught with a gun and you have a conviction for a misdemeanor crime of violence no matter how long ago, you’re looking at a federal felony. Sometimes, laws targeting guns or other property are passed with grandfather clauses. For instance, it’s against the law to own a handgun in Washington, D.C. unless you registered it prior to the passing of a stupid law in 1976. If you properly registered it, you’re untouchable as far as the police are concerned. If you get a new job in the District and move your trusty .38 to your townhouse and you’re caught—forget the job and find a lawyer. Governments, when we let them, like to pass laws on guns and other property, but they don’t like grandfather clauses because they’re too hard to enforce because they create two different classes of people. A handful of states and localities have now gotten smart and are using a Lautenberg-like pattern; continued possession is the crime, not the original possession. Thus Illinois and Massachusetts can demand that you get a license to continue to possess your guns even though you purchased them many years before such schemes were passed. So, why am I gassing on about this? It’s simple. A state government (in Maine) passed a law that you can’t possess koi fish and it has no grandfather clause. They won’t bust you for having owned them for 15 years as in this case, but they will bring the full force of law against you if you continue to own fish. Today koi, tomorrow the guns. What a strange, dark world we’ve made. This morning, I irritated Denise and probably the neighbors with a full throated, Kim Dutoit patented, red curtain of blood rant that had the cat shrieking from the room. I won’t iterate here what Denise had to hear, but I do remember that the phrase Nazi, jack booted thugs was liberally used. This rant had been building for awhile and I must admit that it felt good to give vent to it. Three recent stories stick out in my mind as the instigators of my present foul mood. The first is from Illinois. Kim mentioned it recently. It seems that the governor of Illinois, Rod Blagojevich, feels that any one who owns a firearm in the Chicago Metro area must be a gangbanger. That he said this at the opening of a shooting facility only adds insult to injury. Next, we have a leading member of the Cook County Board, Joseph Moreno, suggesting that the police should go house to house to “pull every gun out of Cook County”. Grossly unconstitutional, but since when has any Chicagoland government official, elected or otherwise, given a rat’s patootie about the Constitution. The second story comes from my old home, the People’s Republic of Massachusetts. While driving in to work yesterday, I heard on the Scott Allen Miller show on WRKO in Boston, that the police chief of Lawrence, Massachusetts is going to revoke the gun permit of Marine SSGT Dan Cotnoir. In case you haven’t heard the story, Dan is a former marine of the year who was attacked in his own home by an unruly mob. He had called the police, but they never showed up. In fear for himself and his family, SSGT Cotnoir fired a shotgun into the ground and with that, the mob got the hint. The police, this being Massachusetts, decided that SSGT Cotnoir was the problem and he was charged with attempted murder. Amazingly, a Massachusetts jury acquitted him. But since this is Massachusetts, and it is up to the police whether or not you have constitutional rights, Police Chief John Romero has decided to deprive an honored marine of his god given rights. As you can guess, the bile was churning in my stomach at this point. Scott Allen Miller and his band Red State are putting on a benefit concert for SSGT Cotnoir to help defray his legal expenses. Finally, this morning, I was reading Joe Huffman and came across this gem. It seems that the police in California with the help of the BATF are going to confiscate firearms and bullets that are in a configuration that they deem to be illegal. As in Massachusetts, the laws in California are so arcane that you have to be an attorney to even begin to figure out what is legal or not. But be that as it may, it is especially outrageous that they would charge someone with a felony for mere possession of a bullet. A felony for people who have committed no crimes and have not harmed ANYONE. This story finally put me over the edge and I went into full rant mode. Suffice it to say that I had little nice to say for the people who would agree to the mission of confiscating firearms that girly man Governor Terminator thinks are scary. Now that I have cooled down and have had time to cogitate on what should be done about these egregious actions, I have decided on what I think is the best course of action for gunnies. It’s simple, but also incredibly difficult to accomplish for a lot of people. There are those who will say that we should continue the fight there and that there are a lot of good people in those states that believe in RKBA. My answer to that line of reasoning is that it’s too late. The fight in those states was lost decades ago and the fat lady has already left the stage. We need to pool our resources in places where we can still win. Places like New Hampshire, Wisconsin, Pennsylvania, Arizona, Nevada and Oregon. With the additional votes of people that have moved from the four fascist states, we can stop this garbage from ever happening in the free states. All of the states I have listed are on the cusp. They really could go either way. With the addition of gun rights supporting, liberty loving citizens, we can win the fight in these states, shore up our flanks, and then move forward. At the very least, if you live in California or Illinois, which seem to be in the vanguard for gun confiscations, get your collection out of state, so that the jack booted thugs can’t get your heirlooms when they inevitably come. You gotta love New Hampshire. Bill and I fled Massachusetts mainly because of that state’s restrictive gun laws. New Hampshire gun laws are few and far between, which is just the way we like it. For those poor unfortunate gunnies who still live in Mordor Massachusetts, here are a few highlights of our adopted state’s laws. I'm not positing this to gloat; I’m posting this for educational purposes only (yeah right). Remember, I’m not a lawyer and I’m only pointing you to laws. First, New Hampshire has a state preemption law (the main laws are cited here and this one is 159:26). That means that no gun-banning police chief, mayor, alderman, town manager can deny you a gun license simply because he doesn’t like you. In fact, there is no need to have a gun license if you aren’t going to carry a concealed gun. In Massachusetts, you must have a license even if you never take your rusty shotgun out of a closet. New Hampshire has a shall-issue license to carry (159:6). Mine is a little rectangle of paper with my signature, the Deputy Police Chief’s signature, my name and address, and a brief description of me. It took me a couple of days to get it and it cost $10.00 total (no training fees, no nothing). As far as New Hampshire is concerned, I can carry in a church, school, and everywhere else except a courthouse (159:19). By the way, no photograph or fingerprints are required and state law demands that all license information remain confidential. New Hampshire has barred itself from ever operating a “voluntary surrender and destroy” program otherwise known as a gun buyback (159:25). If someone’s silly enough to give the state a weapon, New Hampshire must sell it at auction or use it. I’m not sure, because of preemption, if this prevents a town from sponsoring a gun buyback. Still, it’s a step forward. There are laws dealing with sales. In fact, there was once a record of sales law (159:9) that could have been an infringement on gun rights, but it was repealed in 1996. Someone who’s not in the gun business can sell a gun to someone personally known to them (159:14). I am not sure how one defines “known to them,” but it’s a lot better than Massachusetts’s registration and licensing scheme with all of its paperwork and demands. Most of the other laws parallel Federal law—felons can’t possess a gun, no sales to minors although a parent can give a minor a gun (159:12), altering serial numbers, and provisions on committing crimes with guns. Chapter 159 has four other parts (A-D). One was on the purchase of shotguns and rifles, which was repealed in 1996. Part B covers shooting ranges and gives full protection to ranges so long as they were present before noise ordinances were passed or neighbor complaints made. To be complete, Part C dealt with a criminal history check and it was repealed in 1994. Finally Part D deals with the more recent criminal history checks. The Department of Safety is the point of contact for the NICS check made when one buys a gun and it cannot keep records on people who pass NICS check. There are laws that govern how guns are used in hunting, but overall, New Hampshire gun laws are focused on illegal use of guns, not on simple ownership and lawful use. Contrary to Massachusetts’s laws, they are easy to read and understand (click here for an example of obtuse writing from a Massachusetts law). Our gun laws probably aren’t as good for gunnies as Vermont’s laws, but still way to go New Hampshire. Work is still keeping me busy, plus I'm very sleepy today. Saturday evening, Bill and I went to a double feature at a nearby drive-in theater. The last movie ended at 2:00 am, so by the time we got home and to bed we were seeing 2:50 on the clock. We slept in until about 10:30, which meant that I could not sleep last night, leading to the inevitable head nods while the boss drones on. In other words, you won't find a longish essay here today. Instead, I have a movie related question. Bill and I saw "Pirates of the Caribbean" (Part 2) and "Cars." Pirates included a scene in which our heroes have to shoot a cargo net containing six casks of gun powder and one or more barrels of rum. The shot is shown exiting the gun barrel about ten yards away from the casks. You guessed it, the whole thing went boom. Why does Hollywood persist in thinking that a little lead pellet, without the benefit of incendiaries, will blow up gunpowder, gas tanks, ships, planes, and assorted stuff? It won't. Of course, it's entertainment and not the real world, but people start believing that bullets have these mythical powers and must be banned for all but a few. That's the trouble with these scenes and now back to my nap work. Every now and again The New York Times surprises me. This time they published an article in the travel section that describes getting a Texas concealed carry license (registration probably required). It’s relatively free of snark too. One or two phrases are cringe-worthy such as “Nationwide, for better or worse, Americans own some 220 million guns, and half the households in the country are believed to be armed.” For me, there is no worse when good people own guns. The author also turns his nose up at the clothing and armaments of his instructions, but even that is not too intrusive. Overall, it is a descriptive article that even includes good advice on shooting a handgun. Give it a read. Once again I am outraged at our representatives. The US House passed a bill that would outlaw online gambling in America (the Senate still needs to vote on the bill). I’ve mentioned before that I play penny-ante poker at an online casino. I find it relaxing, I improve my skills, and I almost always win. And don’t tell me I could play for free. If you’ve ever tried it, you’ll see people going “all-in” with a seven-deuce unsuited. After all, it’s only free points they can renew in an instant. Now the House wants to protect me from spending my money in a way I see fit. Their bill puts teeth in laws against online gambling and cracks down on banks and intermediaries that pass money to online casinos. Don’t these representatives have better things to do? Shouldn’t they pass bills that would remove unconstitutional and unfair gun laws? What about homeland security concerns? What about cleaning up the tax code? What about—whatever? No, I guess the representatives are only trying to nanny us because they “know” what is best for us. Even a Massachusetts liberal, Barney Frank, sees the bill as a new form of prohibition that will not work. Unfortunately, a lot of the bill’s supporters are Republican although many Democrats also voted for it. It’s nannyism like this that prevents me from becoming a Republican even though they are much better than Democrats on gun rights—a primary interest. Here’s something else to consider. With a fall of a gavel, the House moved to make it illegal to use credit cards, check, and other financial instruments to gamble online. Using this model, a future House of Representatives could pass a bill that makes it illegal to use financial instruments to buy ammunition, gun parts, gun books, or accouterments online. A truly evil group of Representatives could even pass a bill that banned the use of financial instruments to buy guns period. One could always use cash, but even that could be regulated with harsh banking rules. Also, imagine if a gun store owner had to buy his inventory with cash. Therefore, legislators wouldn’t have to touch the Second Amendment or make guns illegal, they would just make them harder to get. Making it harder to get guns is Massachusetts’ model. With its licensing and registration hoops, its legislators have made it much harder for an average person to buy a gun. Because there is so much effort involved, many people don’t bother with it. Or they own a gun illegally. Nannies are never satisfied. Their urge to do good just keeps on going. Nannies count on the support of good people who believe that “someone needs to do something about that.” Yesterday it was drugs, today it’s online gambling, tomorrow it might be guns. Just remember, you may support a law that seems good, but eventually someone will sponsor a bill that will outlaw something you enjoy. 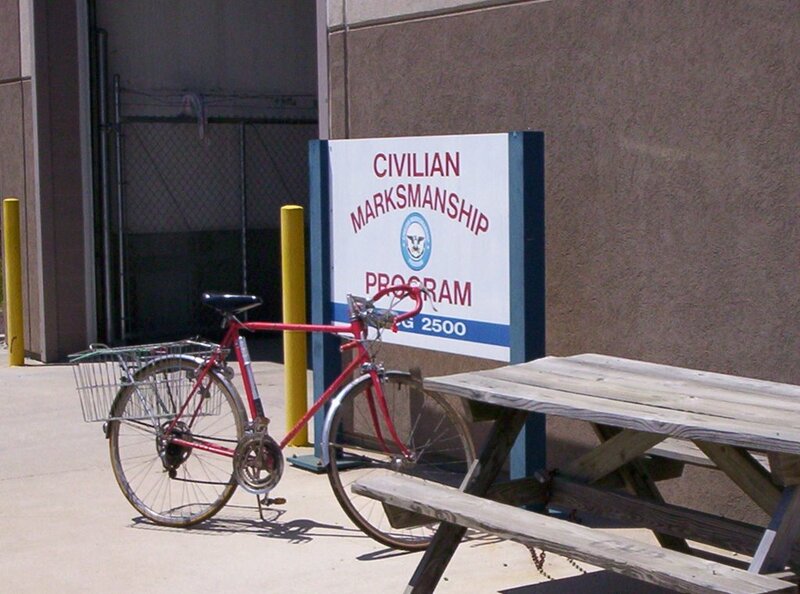 Bill and I managed to visit Camp Perry and the CMP store yesterday. I don't know how many of you have had the opportunity, but it is a good trip for gunnies. We arrived on the Thursday before the start of the Camp Perry National Matches. Pistol and rifle shooters from all over the country will be coming here to compete beginning Sunday. Too bad we're not among them. As you can imagine, there was a lot of activity around the ranges--sprucing them up for the big week. I couldn't help but imagine what the area will be like next week, the ranges full, the small of powder, the sound of guns. When we entered the camp, the guard directed us to the CMP store. 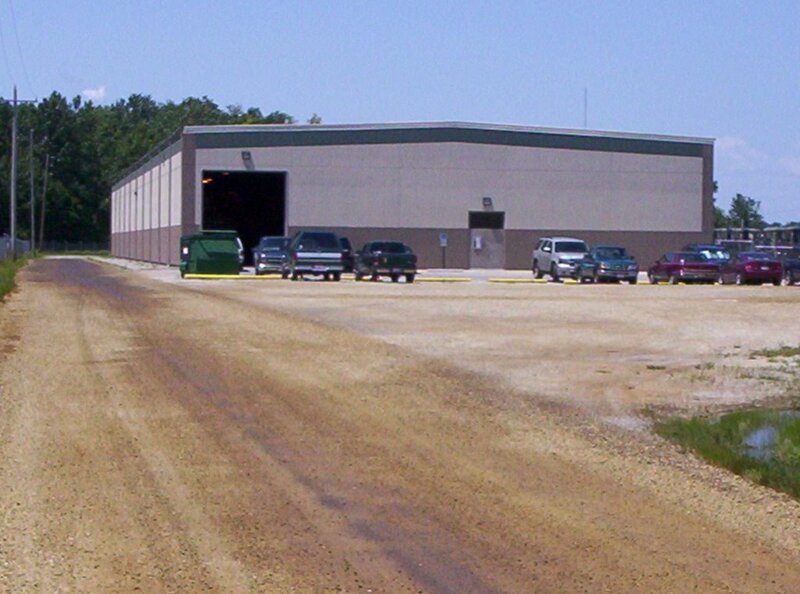 The store is in a warehouse in a corner of the base reached by a gravel road. It’s small although there are a lot of "behind the scenes" areas. We roamed around about 100 racked M1Garands of various grades along with 1903 Springfields and .22 target rifles. Many of the guns were still thickly coated with cosmoline. The staff helped about four people buy rifles while we were there. I was tempted to start my paperwork for a .22 target rifle, but looked at my checkbook balance and decided to wait for a better time. 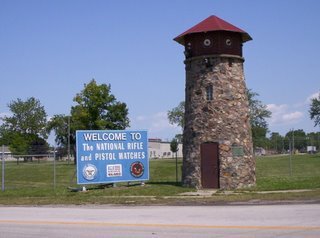 Besides, I’m not too sure about driving through New York State (we will be staying the night there) with a rifle in the car. We picked up a bunch of Lake City .30-06 surplus ammo, a training DVD for Bullseye Pistol (never hurts to learn more), and a couple of books. We even got a souvenir CMP pen. You have to do paperwork to buy ammo at the store, but Bill has already bought a 1903 from them and they had his information in their computer. We have a little trepidation about carrying bulk ammo across New York State. Here we are free Americans and worried about carrying a legal product bought from a federally chartered public corporation. But, there you have it. Life in America today. If you find yourself in Northern Ohio, be sure to stop at your CMP store. Bill and I are traveling again. This time we're going to his cousin's wedding and an impromtu family reunion (his family, but I'm a member of it now that we're married). We're near Cleveland, Ohio staying with Bill's aunt and uncle. We have some gunnie plans if they work out. For one thing, Camp Perry and the CMP store are not too far from here. Hmm...guns to fondle, books to buy, armory-type tools to take home. What's a girl to do? Of course, wedding rehersals, family dinners, and everything else may be the end of gunnie plans. We'll keep you posted. As long as I can remember, I have been an Anglophile. I can’t quite explain why, but I have always been fascinated by English culture and society. So I was thrilled when I got assigned to England as my first assignment in the Air Force. When I arrived there, it was actually like I was returning home. I loved the pub culture and the general environment of the country. But after some time, I began to realize that what I loved was not the England that exists today, but an England of the past, an England that had confidence and would bear any burden, an England that unfortunately no longer exists. My realization of this is one of the reasons that I am not as outraged as Kim by this bit of tyranny. This kind of thing is becoming all too common in Blighty. Five years ago, I would have been spitting angry, now I just feel a deep sadness. It’s depressing to see a society and nation you once respected in decline. But in the end, how much pity can you have. England was and still is a democracy. The majority of the people of England voted for the politicians that passed the laws that allowed this travesty to happen. Some people are fighting against the tide of statism in England, but I suspect it will be futile. I continue to be an Anglophile and I will visit England in the future, but I will go there to see the glories of England's past and try to ignore the present. It isn’t futile here, yet. We can still fight and we can still win. We have made a lot of progress over the last 20 years and we need to keep pushing. One way to do this is to refuse to live in a state that requires gun registration and permitting. Come live in a free state like New Hampshire. We need more pro freedom voters here and in other Second Amendment friendly states.